Definition: Mycobacterial spindle cell pseudotumor (MSP) is a rare benign lesion characterized by local proliferation of spindle-shaped histiocytes containing acid-fast mycobacteria. Mycobacterial spindle cell pseudotumor is a rare tumor-like lesion characterized by the proliferation of spindle cells engorged with mycobacterial microorganisms. Most reported cases of MSP occur in the lymph nodes, skin, spleen, and brain in patients who are immunocompromised, particularly following solid organ transplant and in those with AIDS. 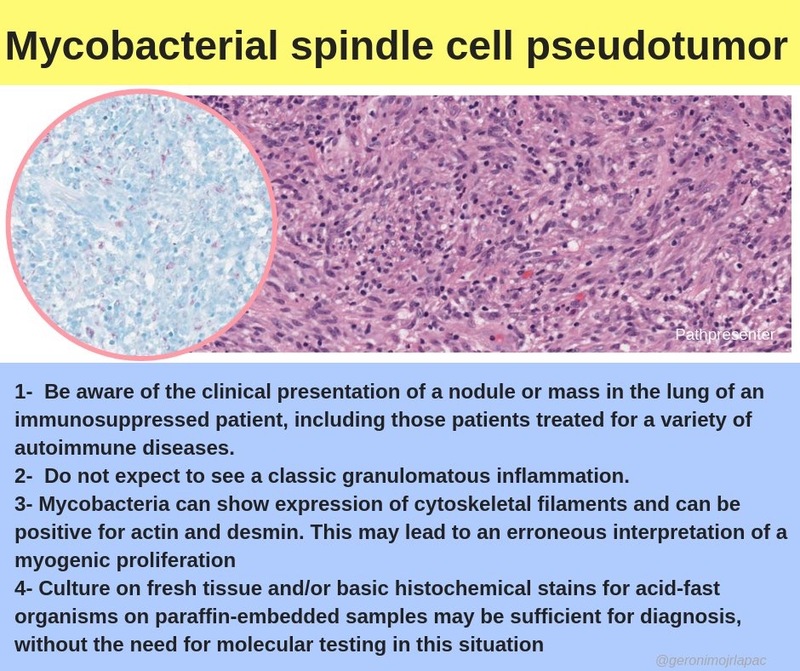 Mycobacterial spindle cell pseudotumor should be included in the differential diagnoses of a spindle cell lesion in the skin, especially in immunosuppressed patients. Histologically, the lesion is composed mainly of spindle cells focally showing a vaguely storiform pattern. In limited focal areas, foam cells, epithelioid histiocytes, and multinucleated giant cells are seen sparsely. Ziehl-Neelsen staining shows numerous acid-fast bacilli within the spindle cells and epithelioid histiocytes. The acid-fast bacilli are determined by culture and polymerase chain reaction to be Mycobacterium intracellulare.